It’s the last night of Hanukkah, and all the candles on the hanukiah are ablaze. Choose your level of difficulty, and then put the pieces into place. Put your ninja skills to the test in this multi-level battle extraodinaire. Use your Ninjew to battle through the Nexus of Holidays and save Hanukkah from those evil, no-good Holiday Snatchers!! 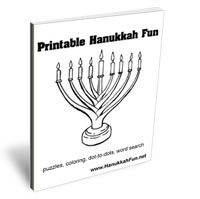 Click on any of the thumbnails to download the printable Hanukkah coloring pages in PDF. You will need the free Adobe Reader to open and print the files. You have two minutes to put the pieces of the Hanukkah menorah back together. Can you beat the clock? 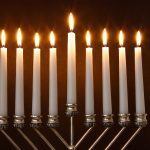 How much do you know about Chanukah? 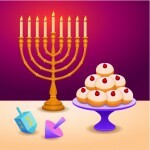 Can you figure out how to complete all the screens and become the dreidel master? Are you ready for some whirligig fun? Color these dreidels how ever you like! Color this Hanukkah menorah any way you like and then save the picture and send it with your Hanukkah greetings to your friends!